Himachal Pradesh's Palampur is set to see an interesting battle in the Assembly election scheduled for November 9, when two new faces from the ruling Congress party and the opposition BJP will fight a former MLA. Himachal Pradesh Assembly Election 2017: Debut entrants Indu Goswami and Anil Butail. In Himachal Pradesh's Palampur constituency, a former MLA is taking on a poll battle against two debut entrants from BJP and Congress, spicing up this year's assembly elections. The state president of BJP's Mahila Morcha, Indu Goswami is pitted against Congress' Ashish Butail, the son of outgoing Speaker and current MLA from Palampur, Brij Behari Lal Butail. The debutants face challenge from former BJP legislator Praveen Sharma, who joined the electoral battle as an Independent candidate after he was refused ticket by the BJP. 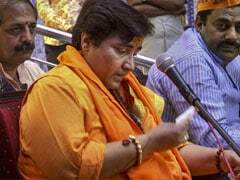 Mr Sharma is believed to be close to veteran BJP leader Shanta Kumar, a two-time Himachal Pradesh chief minister and could dampen the prospects of Ms Goswami. "The people of Palampur have asked me to stay in the poll. The top leadership of the BJP offered me chairmanship of boards and corporations, but I refused as I wanted to serve the people than to sit in a room," he said. 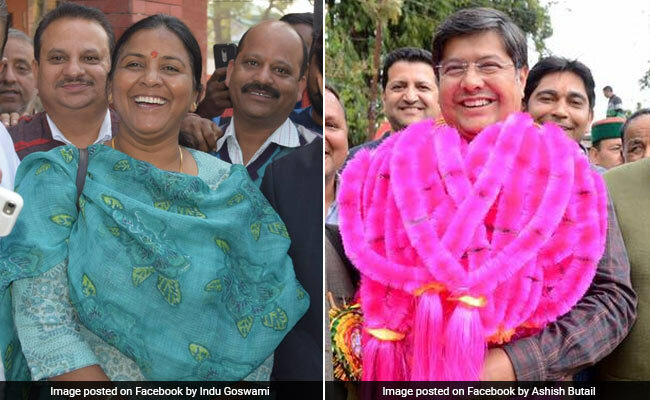 Ms Goswami, who is seen as an outsider as she hails from the adjoining Baijnath constituency, reserved for a Scheduled Caste candidate, is hardly dissuaded. "I am a dedicated worker of the BJP for three decades. I have worked in the state women commission in 1999 and then worked as state president of the Mahila Morcha. As a BJP candidate now, I shall prove my worth by bringing the much-needed development to Palampur," she said. Ms Goswami claims to have lobbied for 10 assembly seats for women in the assembly elections. "I am grateful to the national leadership that it has given six assembly seats to women," she said. A rally in her support by Prime Minister Narendra Modi, with whom she worked closely when he was party in-charge of Himachal Pradesh, is also expected. Thirty nine-year-old Ashish Butail, from the politically-established Butail family, has been given the responsibility of carrying the legacy. His father is a respected leader who won the Palampur assembly seat five times out of the 11 elections held after the inclusion of the Kangra district in Himachal Pradesh from Punjab in 1966. However, encouraging dynastic politics in Congress has not gone down well with the party workers. Ashish Butail could also face opposition from Gokul Butail, his cousin and IT adviser to Chief Minister Virbhadra Singh. Gokul Butail had applied for a ticket, but was denied. "My father, Brij Behari Lal, has served the people of the area for 50 years. He has a clean image. During the past five years, crores of rupees have been spent here on development-related work by him," Ashish Butail said. "Now it's my duty to complete the pending work, before starting the new ones. I hope the people of Palampur will send me to the Himachal Vidhan Sabha in view of our family's ties with the people and the work done in the area," he added. Brij Behari Lal Butail was also the richest MLA in the 2012 elections in the state. He owned properties worth Rs 150 crore, besides other movable assets. Palampur, a hill station in the Kangra Valley, derives its name from the local word 'palum', meaning lots of water. Numerous streams flow from the mountains to the plains from Palampur. It is also the hometown of Shanta Kumar, former chief minister of the state and a BJP leader. Brij Behari Lal Butail had once lost the election to Shanta Kumar in 1990 and Parveen Sharma in 2007. The polling in the state would be held on November 9 and the counting of votes would be taken up on December 18.